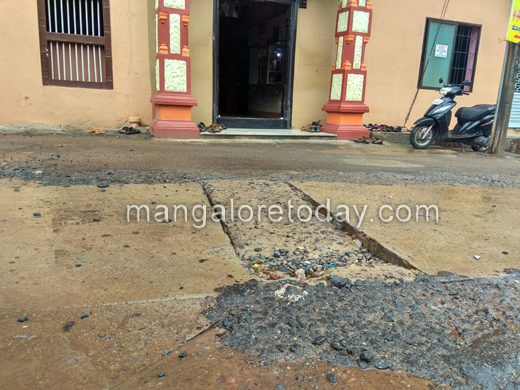 Mangaluru, July 02, 2018: The photograph shown here is that of a collapsed concrete slab covering a storm drain right in front of the Sri Raghavendra Swami Mutt in Mangaluru. The slab is literally broken and has sunk revealing the sub-standard works that are likely to pose danger to the public. What is alarming here is that the side drain works were done just before the monsoons during the months of March and April to ensure free flow of rain water. The road had remained closed for traffic for several days to facilitate the work. When the works were complete the public had heaved a sigh of relief and had even put up a banner thanking the local corporator. 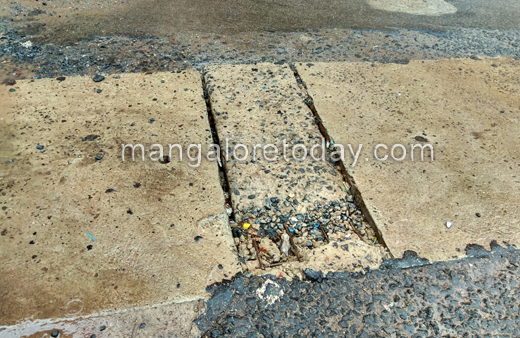 Earlier, in the absence of proper side drains, it was a common sight to see the rain water right from the Central Market area up to Bhavanthi Street flow on the road and join the huge storm water drain near the Trishuleshwara Shrine close by the Raghavendra Mutt. Though the completion of the side drain works had pleased the locals, the happiness has not lasted long with a concrete slab giving way, thereby raising doubts regarding the standard of works. Hope the authorities concerned would take note of the problem and do the needful.